With the occasional picture from Will and his sunny adventures in Malaysia, It’s just me again for another weekend Geekly Review. Friday night I went over to a friends house for a couple of hours to play some Mario Kart 8. Can’t get enough of this game at the moment. Still trying to help him get at least 1 star on each cup to unlock the gold parts for him. We’ll hopefully make a start on my save soon. At about 8:30 we called it quits and headed to a pub I used to visit back in my younger days to see a band perform some songs that were also reminiscent on my younger days like Audioslave, Ash, Queens of the Stone age etc etc. When the band finished we carried on drinking and were eventually involved in a pub lock in. My 2nd one of the year which isn’t really something to be proud of I guess. Eventually home by gone 3am, cooking food up while drunk eventually getting to sleep nearer 4am. Saturday there was nothing planned, which is always a good Saturday. So I watched the Formula one qualifier then spent the rest of the day playing Far Cry 4. Okay so I’m really enjoying the game, but on this sitting I couldn’t help but notice a few bugs that weren’t present on my first few hours. I’m 14 hours in now, and just reached the North. I’ve noticed that trees are swaying in the wind, but rather than gentle swaying they are full on headbanging / moshing side to side. Another thing is the letter on your map to identify who’s mission you can go to, that is constantly flickering. Another one when setting my marker to a destination, normally the road has a yellow trail to follow, well on Saturday it didn’t. And this is the one that really ticked me off. 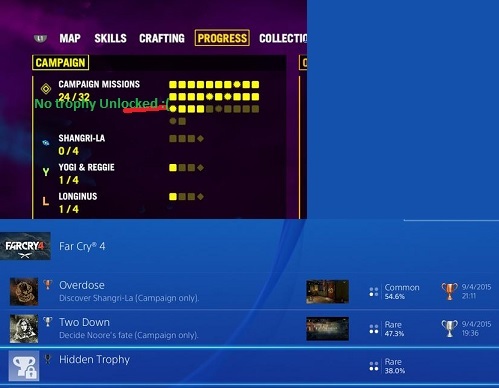 I’ve completed a mission in which I should have been awarded a trophy, Yet I didn’t get it. I got a few other trophies after this mission for miscellaneous activities in Kyrat so this is quite annoying. Other than the cluster of bugs from Saturday’s play through I’m still enjoying it though. Finally onto Sunday which was spent eating good food and watching sports. My wife and I are off on holiday in 9 days time, so we decided to go get a few bits for the holiday. Once done we went to get some food at Spitfire Barbecue in town. Jalapeno’s stuffed with cream cheese and wrapped in bacon to start. I opted for a pulled chicken sandwich for my main, and for £12.95, was expecting it to be epic proportion, however I was left a little disappointed as it was not quite the size I was expecting for the price and was consumed within 4 mouthfuls (no joke). Oh well. I headed out when back to watch Manchester United dominate Manchester City a result I was very happy with. I then watched the Formula 1, followed that up with the final day of the Masters golf and ended the weekend with Match of the Day. And with that another weekend came to an abrupt end.